Why do Eric Kerridge and Mark Overton disagree about the nature and timing of the British Agricultural Revolution? There is no video this week. apply the historical thinking concept of continuity and change in your analysis of secondary sources, and begin to practice the skills of historiographical thinking. Paraphrase (i.e., summarize in your own words) the main ideas of Eric Kerridge and Mark Overton about the British Agricultural Revolution. What kinds of evidence do they use to support their arguments? How are their arguments about the British agricultural revolution similar or different? Answering the kinds of questions listed above will help you better understand some important aspects of early modern European social and economic life, and also help you understand an aspect of European historiography. In the previous two Lessons, we looked at broad understandings of the relationship between rulers and ruled in early modern Europe. We would risk over-simplification if we said that story was unchanging, but it did maintain a certain broad stability throughout the medieval and early modern eras. Despite periods of political and religious upheaval, such as the English Civil War, the rule of nobles over subjects was maintained in most parts of Europe until the end of the eighteenth century. Even the execution of King Charles I in England resulted in the end of the English monarchy for only a short period. "The English Revolution," as the period of the English Civil War is sometimes also called, ended with the restoration of the British monarchy. The major development in this restoration is called the Glorious Revolution that brought King William and Queen Mary to the throne in 1689. This was not a revolution in the sense that we normally think of it today -- an overthrowing of a regime. Rather, it was a revolution in an older meaning. Like the revolution of the planets, the political system in England had returned from where it had begun: monarchy! The old order was reestablished. Continuity with the political past was maintained once again. In contrast with our modern world that is dominated by a sense of constant change, continuity was a strong factor in the medieval and early modern worlds. The realities of agricultural life defined much of life before the modern era, and in agriculture continuity was a welcome force. 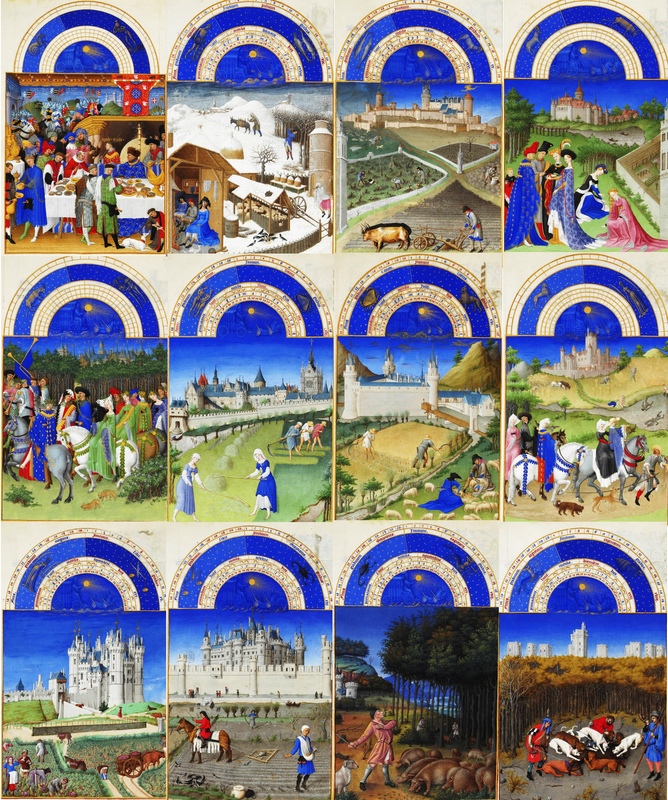 The Limbourg brothers' famous images of the Book of Hours show a basic seasonal pattern of life on the land in the medieval era. Most people today do not have any close connection with agricultural life. How many people do you know who grow their own food, or get their food from the farmers who produce it? Chance are, not many, if any at all. Most of you (we suspect) shop for your food in large stores. A related feature of life today, as opposed to the world before 1800, is that most Canadians (and Europeans) live in cities. In fact, by pre-modern standards, St. Catharines (with its current population of about 130,000 people) would have counted as a gigantic city. Not all important historical developments involved political or religious events. One example is the growth of cities (urbanization). According to estimates summarized by Prof. David Cody, the population of England's largest city, London, grew from about 50,000 people in the year 1500,​ ​ to about 300,000 in 1700, and 900,000 in 1800! Agricultural production, therefore, had to increase (and quite dramatically) in order to feed this increasingly urban population. It did, and historians have come to call this the Agricultural Revolution, a period of greatly increased agricultural productivity that was able to feed this increasing, and increasingly urban, population. In this Lesson we look at this "revolution." This was a revolution of a sort different from both the Glorious Revolution and the famous French Revolution of the late eighteenth century (a subject of one of our later Lessons). The British Agricultural Revolution involved change, yes, but not the rapid upheavals of the kind that could come with political rebellion, nor even the return to an earlier kind of order. The main questions are: How did this change in British agriculture come about? And when? In this week’s exercises you will learn about some of the basic features of England’s agricultural economy, and how it changed over the early modern period. You will also see, however, that historians have different explanations of not only why that happened, but also when it happened. Thus, you’ll also learn about some of the broad interpretations that scholars have proposed for making sense of agricultural change in European history. In other words, this Lesson gives you your first opportunity in this course to think explicitly about historiography –- that is, interpretations of evidence from the past. These interpretations are a crucial part of what historians do. In a sense, when you write essays you are creating your own works of historiography. We often call these interpretative works "secondary sources." By "secondary" we do not mean to imply that they are lesser. "Primary sources" are simply the basic materials (the evidence) that historians work to make sense of in "secondary sources." They are both essential parts of the practice and the study of history. Primary sources are of course really important for the study of history. If you look at the historical thinking resources on sources and evidence (part of the toolbox in previous Lessons), you might notice that they focus only on primary sources. Although these historical thinking resources are valuable for all levels of historical study, the webpages that outline them are aimed at teachers and students in schools up to grade 12. One of the challenges of the study of history, especially at the university level, is that you have to learn to interpret not just primary sources. Interpretations of past evidence also require your interpretation, and your understanding of the interpretations of other historians! When we focus on understanding the process of interpretation, we move into the realm of historiography, the creation of and work with secondary sources. You'll get lots of practice working with historiography in this course, so it's good to pay attention to this distinction between primary and secondary sources. To begin your practice of reading secondary sources, you will work with texts from two historians –- Eric Kerridge and Mark Overton, both historians of English agriculture in the early modern period. Both accept that greatly increased agricultural productivity allowed cities like London to grow; growing cities meant workers could work in factories, work that took them away from fields; and growing agricultural production meant that those workers could be fed. But as you’ll see, while they agree on what happened, they disagree on why it happened, and indeed on when it happened. Kerridge maintains that the major changes took place in the 16th and 17th centuries, while Overton argues that these changes really took place in the 18th and 19th centuries. Examine each historian's focus, and evidence, as you assess their arguments. The main skill to practice this Lesson is the analysis of secondary sources. In effect, you'll be learning an important skill that is related to historical thinking. We could call this "historiographical thinking". The section above provides you with more details about historiography. A historical thinking skill that is related closely to historiographical thinking is the recognition and analysis of perspective. Not only can we analyze differing perspectives in primary sources from the past, but we can also recognize how people's perspectives (including our own) are complex and varied "today". This is of course also true of the writings of historians who try to make sense of the past. In this course (and in all your other history courses -- or courses on other subjects) practice comparing perspectives in all the sources you examine. One further aspect of historical thinking that is worth reviewing for this Lesson is the skill of identifying continuity and change. After all, it is the issue of change that Kerridge and Overton discuss in their related but importantly different interpretations of British agricultural history. Note that continuities and changes can take place in the short, medium, or long term. In other words, our view of change depends on the perspective that we take. This is one of many examples of how the elements of historical thinking are interrelated with one another. Follow the links in the two paragraphs above to read more about perspective, and continuity and change. 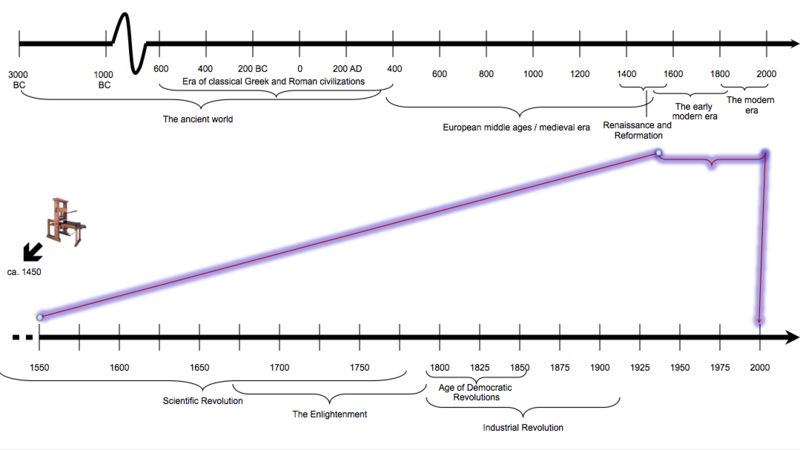 You can use the chart below as a rough guide to aspects of European and Atlantic World history. These chronological categories can help you think in general terms about continuity and change. Please be aware that the periods outlined on the chart are not "facts" but rather generally agreed upon headings for periods. In a way, they are short-hand for interpretations of lots and lots of sources. There are no primary sources for this Lesson's Forum (although some of the images in the Lesson -- such as the maps -- are primary sources). You should pay attention to how Kerridge and Overton discuss primary source evidence. What types of evidence do they use? How do they use evidence? Do they use the same evidence? 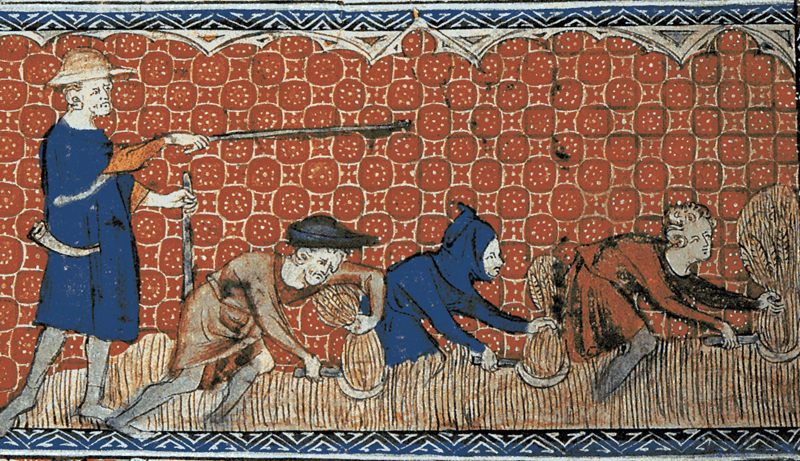 "British Agricultural Revolution," Wikipedia (https://en.wikipedia.org/wiki/British_Agricultural_Revolution). This source is meant to give you general background. Think about how it compares to Kerridge's and Overton's interpretations. Eric Kerridge, “The Fruits of Enterprise,” The Agricultural Revolution (London, Allen & Unwyn, 1967), pp. 326, 328-332, 347-348. Mark Overton, “The Agricultural Revolution in England, 1500-1850”​ (BBC History online, 2011). One way to think about continuity and change is to examine how cities grew in the early modern period. 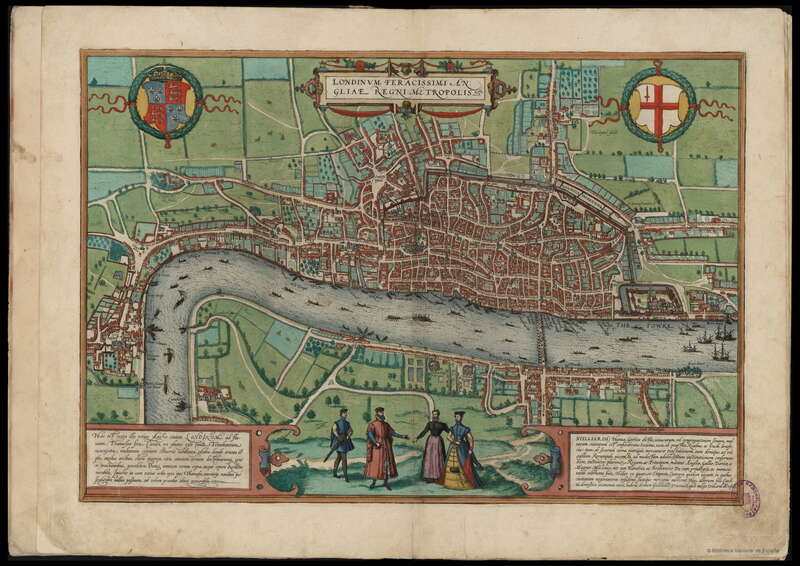 For example, you could compare the map of London from the sixteenth century with the map of London from the eighteenth century that is below. One is from about 1574 and the other is from 1746. What evidence can you find on the maps of political, economic, religious, social, industrial and agricultural life?